A goal of the season contender from Souleymane Doukara that brought back memories of Tony Yeboah at his best lit up Elland Road as Leeds United made it six home wins on the spin in the EFL Championship. Chris Wood also took his tally to 20 goals for the season and a 2-0 success against Nottingham Forest lifted the Whites back into third place. Another clean sheet pleased head coach Garry Monk and United have now played getting up for 10 hours of football at Elland Road since they last conceded a goal. It was not plain sailing initially against Forest although Kemar Roofe put a dangerous cross into the box in the first 15 seconds with Stuart Dallas not quite able to turn the ball in at the far post. The visitors created the first clear chance when Britt Assombalonga did well to bring the ball down on his chest in the box and smashed in a volley that was well tipped over by Rob Green. Wood had the ball in the net on 12 minutes only to be ruled offside before Dallas shot well over from the edge of the box after good build-up play. Hernandez cut in from the left only to send his shot from the edge of the box wide. Assombalonga still looked dangerous for Forest as he latched onto a ball into the box and turned well, but could not keep his shot down. The half petered out somewhat, however, with both sides guilty of playing poor final balls and crosses. Roofe did put in one decent effort after making room well on the edge of the box, although his shot was just over. 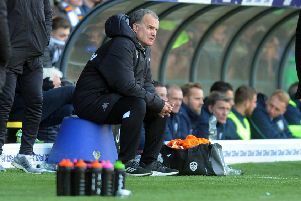 Leeds looked to play faster after the break and gave warning when Kyle Bartley flicked a header wide from a free-kick. Their threat from corners has been well documented in recent weeks and from their second on the night they got their opening goal. Forest did well to block Bartley’s header from Hernandez’s delivery, but the ball fell invitingly for Wood who forced the ball in from close range for his 20th goal of the season. On 73 minutes Wood saw his free-kick deflected wide and from the resulting corner United made it 2-0 in spectacular style. Forest half-cleared the ball to the edge of the box only for the recently added substitute, Doukara, to score with a stunning volley that sent the ball flying into the top corner of the net. It resembled Yeboah’s famous goal against Liverpool and brought the house down with fans in celebratory mood for the rest of the match. Leeds were never in danger of throwing away their hard earned lead and could and should have added to it when Wood latched onto a short back pass only to shoot wide with only keeper Stephen Henderson to beat. Roofe came within inches of a goal with a volley after superb hold up play from Wood, but it did not matter as United were home and hosed for another three points. Leeds boss Monk hailed Doukara’s goal and Wood’s effort again. He said: “It was a fantastic strike - you won’t see many better or cleaner strikes than that all season. “And it was an important goal as well, it gave us breathing space. “It’s a fantastic achievement for Woody to score 20 at this time of the season. But he knows it’s about the team and we need to make sure he scores more goals. “A lot of it goes down to confidence, strikers feed off confidence. Credit to him for scoring so many already, but it’s about wanting more and he’s a team player, you can see that. Monk added: “We upped our intensity and our pace in the second half and I thought we were totally dominant. “I’m very pleased, it’s six wins in a row and six clean sheets. But the important thing was the three points and showing that we can bounce back. “I thought their game plan was working in the first half. But what we’re doing is reacting well to situations. Leeds: Green, Ayling, Bartley, Jansson, Berardi, Bridcutt, O’Kane (Vieira 75), Roofe, Hernandez (Mowatt 80), Dallas (Doukara 71), Wood. Forest: Henderson, Lichaj, Hobbs (Lam 57), Fox, Pinillos, Mancienne, Vaughan, Cash, Osborn, Ward (Bendtner 67), Assombalonga (Brereton 76).